Because I get a lot of questions concerning this topic, I hope to answer most of them with this blog. If you still have any questions you can always contact me or a (local) babywearing consultant. I’m pregnant, can I continue wearing my child? Congratulations on your pregnancy! In most cases you can continue wearing your child when you’re pregnant. I love to compare it to doing sports. Were you doing it already before you got pregnant? If you do it now (during your pregnancy), does your body give you any (pain?) signals that you should stop? No? Great! I wouldn’t recommend suddenly starting babywearing when you haven’t done it before. I don’t know how much your (soon to be big brother/sister) child weighs, but it’s not like you should start weightlifting all of a sudden after finding out you’re pregnant. When you’re already used to the (growing) weight of your child, it will be something you can just go along with. There are situations where babywearing wouldn’t be recommended, please ask your doctor / gynecologist if you have any questions regarding your health situation. With a growing belly and increasing weight of your body and your child, babywearing can get too heavy and you need to listen to your body and give it a break. Please be careful if you already have experienced hip problems during your first pregnancy. How long can I continue wearing my child during my pregnancy? As long as you feel comfortable and your health doesn’t seem to be a reason to stop earlier. 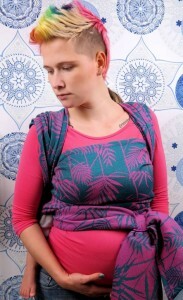 Some mama’s even have been wearing their child right before they were going in to labor, while others had to stop babywearing earlier in the pregnancy. 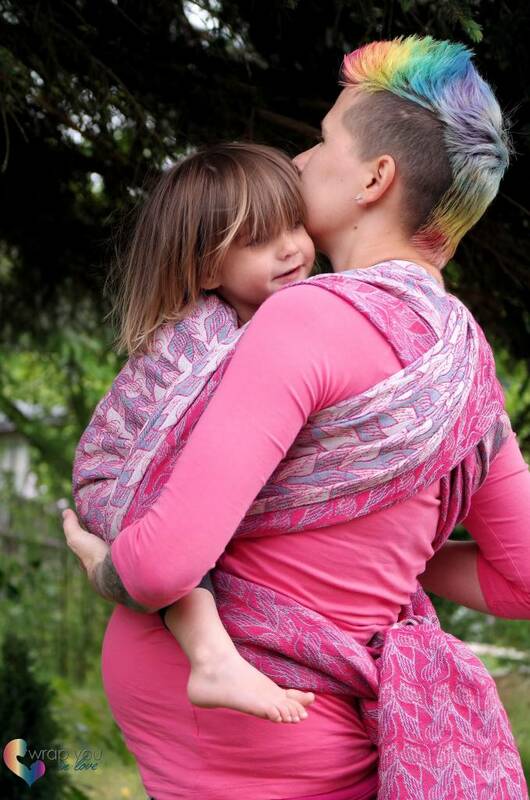 If you were a frequent babywearing pre-pregnancy it’s more likely that you can wear your child longer, but it’s never a guarantee. Don’t forget the weight that your child brings and how heavy your belly/body felt during the last weeks of your last pregnancy. Combining both can make you feel more balanced, but can also wear you out…. Which carry / carrier should I pick? Finding a comfortable carry will be a practice of trial and error. Some mamas find it uncomfortable to wear a carrier with the waistbelt above their belly, where others prefer it this way. Personally (even in the third trimester) I still prefer to wear the waistbelt of a SSC over my belly. I would also pick a half buckle or mei tai over a normal SSC because it’s so much easier to wear it this high (I’m not very tall, so I struggle to get the shoulder straps of most carriers tight enough for a high carry). If you’re looking for a carrier without a waistbelt, just google Onbuhimo. It’s great during pregnancy, but can also be used when you’re not pregnant. It does distribute the weight differently, because there’s not waistbelt, so it might feel heavier on your shoulders. The trick is to wear it high and tight enough. With a woven wrap there are many possibilities. You can continue using a front carry as long as it feels comfortable for you. Even with a big bump it doesn’t hurt my belly to wear my little girl (2,5YO – almost 12kg) over my bump. The only problem is that her head will end up so high that she limits my sight, which is the main reason that I would prefer a backcarry. But for some cuddles at home she’s still worn in a FWCC every now and then. With backcarries I hate it when the knot is putting pressure on my belly. I love the double hammock and instead of finishing it with a knot, I finish it with a slingring. You could also tie the knot in the back if you prefer it that way, or finish tibetan. As your body changes, your favourite carry will (need to) change with it. 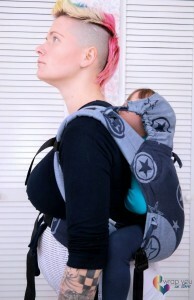 A babywearing consultant can offer you some help in your quest to find the perfect carry for your situation. 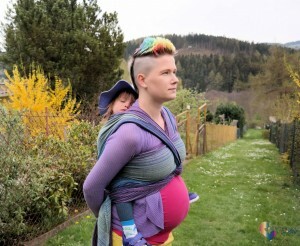 You can keep on using a ringsling during pregnancy, but as it is a asymmetrical carry it wouldn’t be the best option if you have any hip or back problems already. And if your child is still small, please make sure it doesn’t overspread the legs when your belly is growing and you’re doing a hipcarry. 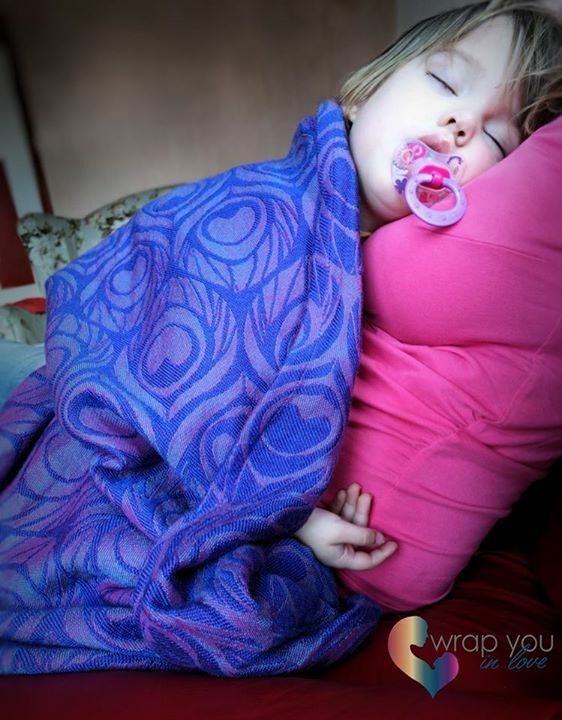 And don’t forget: even if you can’t wear your child right now, you can use your wraps in other ways…. I love to use it as a wrap blanket! This information is not intended nor implied to be a substitute for professional medical advice, you assume full responsibility for how you choose to use this information. Always seek the advice of your gynecologist or other qualified healthcare provider if you have any questions regarding continuing babywearing in your situation.